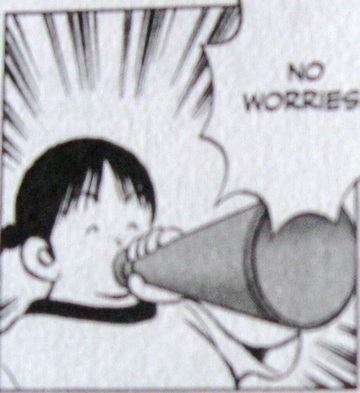 For a second Cross Game MMF post I wanted to talk about Hiroko Okubo, the chubby female manager of the portable team. If you didn’t remember her name, don’t feel bad (I had to look up her first name on Wikipedia myself). 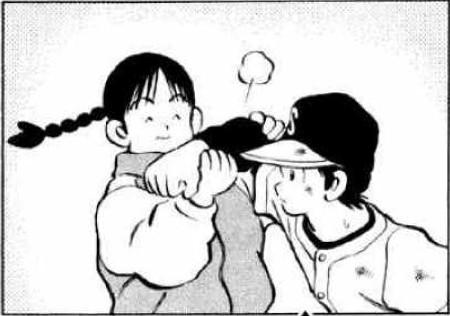 She supports the baseball team, but she doesn’t do much to stand out: she’s not so fully developed as Aoba, and she’s certainly not as integral to the overall plot as Wakaba. Heck, she doesn’t even show as much depth as Risa Shido, her grumpy counterpart on the varsity team. But I think she’s great. Okubo’s an interesting character. She does whatever she’s told, but not in a sniveling, subservient way; she’s actually happy to take care of the team and help out the coach. The third years call her “tubby”, but it doesn’t make her wince or lower her self esteem; it’s just another word that rolls off her back. Later on you find out she’s the granddaughter of the school chairman. She could have used his position to draw herself a better lot, like the interim principal’s daughter does, but instead she takes things as they come. Of course, she says about her grandfather, “My granpa’s very strict about things like that [the deal with Coach Daimon]. Even if it’s a promise with a bad person, he will honor it.” So we can see how much of her good personality came from him. Okubo also has a calming effect on the other players. When the varsity team gets runs off him in their first match Ko pitches a fit in the dugout. Okubo grabs his hand before he can hit something. “Not your right hand,” his pitching hand. Ko calms down. The third years are angry that they’ll never be on the varsity team, but Okubo tells them the (made up) story of the portable coach fighting Daimon and getting hurt for their sakes. They stop showboating and trying so hard, and play some real baseball. And it’s the same for the reader, I think. Cross Game is full of interesting, well-written characters, and has plenty of funny moments, but there’s a bittersweet and often somber tone the manga takes on due to loss, guilt and frustration the characters feel. Not Okubo – there’s a smile on her face as she gives a bright “Okay!” and cheers the team on, and she makes me smile without being a joke or a mockery. She lightens the mood in a subtle way, and that’s why I’m so pleased that she’s a character. I’ve been slow to update on this, but here are a few recent reviews I’ve done around the ‘net. 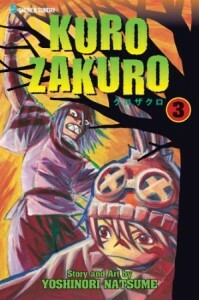 First was Kurozakuro volume 3 , up on The Fandom Post. In this volume we’re starting to get more answers about what is going on, but the story telling is also really weird and clunky at times. And it’s still disappointing that none of the old female characters have returned. Read the rest of what I thought here. On Real Otaku Gamer reviewed the first volume of Blue Exorcist. This manga had a slow start, but the Shonen Jump story is action packed, and has nice background art and awesome character designs. But it’s a supernatural high school story, and I got sick of that idea fast, so I’m not sure if it’s something I’d carry through with. The whole review is here. 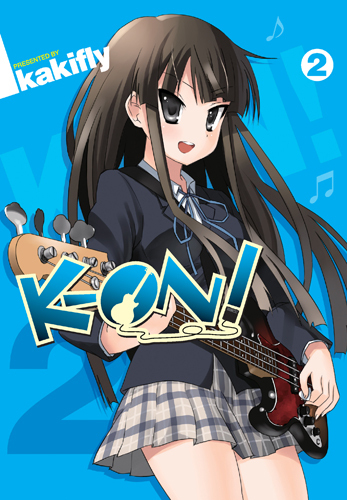 Also on Real Otaku Gamer, I wrote three quick reviews of ongoing Yen Press series: K-ON! , Spice and Wolf and My Girlfriend’s a Geek . Each of them have their flaws, but they’re fun in their own way. And I’m finding myself increasingly biased towards Spice & Wolf. Check out each of my thoughts here. I’ve also gotten some other blog posts done. On Real Otaku Gamer I posted a news clip on Digital Manga Publishing’s eManga website, and yesterday I had my say on the character of Wakaba for this month’s Cross Game Manga Movable Feast. This post is part of the Cross Game Manga Movable Feast, hosted this week at The Panelists. Visit his intro post to learn more about the series, or read my reviews of volume 1, volume 2, and volume 3. This post contains some spoilers, mostly from the first volume of the series. Last week I posted my review for Cross Game volume 3, which comes out next week. This manga is quickly becoming one of my favorite manga I’ve ever read, and sits only just behind Twin Spica for best series I’ve started this past year. On the other end of the spectrum, my review for Sumomomo, Momomo volume 7 was posted on Mania.com. This manga is only good when there are epic fights, and there were no epic fights in this one… I think I quit on this series. Also, a short news post I wrote for Real Otaku Gamer is now up. Hiromu Arakawa is starting a new manga series! Let’s hope it’s as good as Fullmetal Alchemist, or at least better than Hero Tales. After a rush to get everything done for my last MFA submission I’ve been taking this week easy, (which is why I’ve been neglecting the blog) but I shall try to get a manga review on Suite 101 this week. This week I reviewed two manga titles from VIZ Media. I managed to squeeze in a review of Cross Game volume 2 by Mitsuru Adachi on Saturday last week. This manga is really great: the characters are awesome, and I’m riveted just watching them hit foul balls. Check out the review to see the other reason why you should read this manga about baseball. Then I read Nura: Rise of the Yokai Clan, which was considerably less fun than Cross Game. It was just a dull manga about demons, with a lot of problems that add up. Read my review to see what I felt was poor about it. Nothing new is up for Mania, since I’m still waiting for a package of new review books. But when that comes, I should have reviews for Kurozakuro and Sumomomo Momomo. I’ve been reading more of Anne Lamott’s writing craft book, Bird by Bird. Lamott gives good advice on writing, but also on the life of a writer. One chapter looks at something I worry about in particular – jealousy over someone else’s success. Lamott is crazy in a way that I can relate to, and she has a wonderful, bitter sense of humor. I’ve read some out loud to Pat, and he doesn’t find as much amusement, so it may only be particularly hilarious if you’re also a writer. I finished the first One Piece omnibus, and moved to the second. The quality of these books isn’t that great (the paper is thin) but they’re cheap, so I hope VIZ continues them. I also had the pleasure to read the second volume of Cross Game, and just today finished Nura: Rise of the Yokai Clan and a graphic novel of Eros and Psyche. I’ll have reviews up for the last three books, hopefully this week. This week I plan on reading The Magician’s Elephant by Kate DiCamillo and Mockingjay by Suzanne Collins. Any other suggestions? New Reviews, Hero Tales, Black Butler & Cross Game :: Jobs at DMP? One review went up on Mania.com this week, on the fourth volume of Hero Tales. 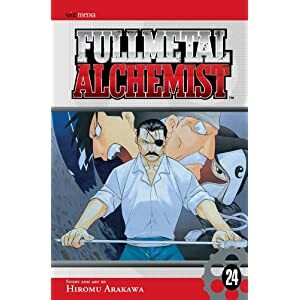 It’s by Hiromu Arakawa, the same woman who wrote my favorite series, Fullmetal Alchemist, but it’s not proving as good. I’m just not feeling as emotionally involved in Hero Tales, and since it’s coming out so slowly I don’t think I’ll be super excited as each volume comes out. Not that I won’t buy it, of course. Two other reviews went up on Suite 101, too. First I reviewed the first 3 volumes of Black Butler from Yen Press. It’s interesting, and I actually do get why people love this series so much, but I don’t think it’s for me. Yesterday I posted my review of Cross Game from VIZ Media. This is a really well done manga about playing baseball and growing up, and is definitely one of my new favorite series. VIZ printed the first 3 volumes in one, so I got to read the book in a big chunk, which was awesome. Something neat I found out yesterday: Digital Manga Publishing is creating a “guild,” where they will be letting people translate, edit, and retouch manga to be distributed digitally. If this works, it sounds really fantastic. I’ve already applied to be an editor, so we’ll see if I get taken on. I heard the information from Daniella Orihuela-Gruber, who posted the information on her website All About Manga. She posted more information, and more potential questions about the Digital Manga Guild, in her blog post.